Passport America 50% PA is not valid October through March. 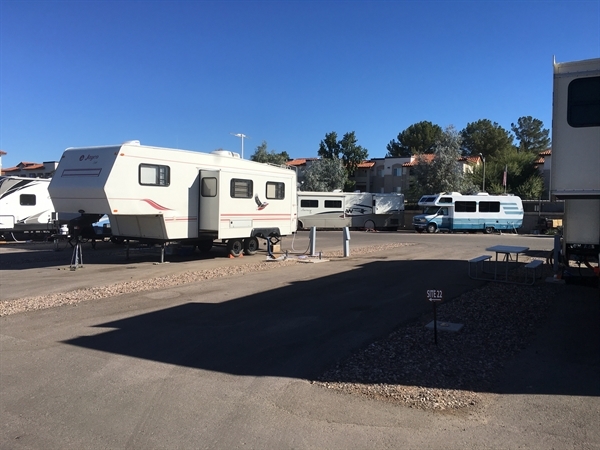 Good, clean RV park with very friendly people. It is close to downtown Tucson, with restaurants and supermarket (Safeway) nearby. There is a small pool (unheated) which is fine for cooling off. The sites are nice, flat and paved. We had a premium site which had a chiminera for campfires at night. The clubhouse is big and well-stocked with books, games, pool table and more. People are super friendly and helpful. It's a mix of snowbirds and people passing through. Location is best here to get to hikes and downtown. They have laundry (one washer, one dryer) and bathroom facilities, but no shower so you have to be fully self-contained. This is the reason I gave it 4 stars as opposed to 5 stars. Otherwise, we enjoyed our stay and would come back here again.